It also means less meat, which is a real turnabout for this former carnivore. Cooking for my vegetarian children helped open my palate, but I’ll admit it has mostly been the research showing that a moderate Mediterranean style diet can lead to a longer, healthier life. This seems like the kind of eating I can stick with for the long haul and it’s obvious that I feel better when I eat better so I’m really making a lot of changes. 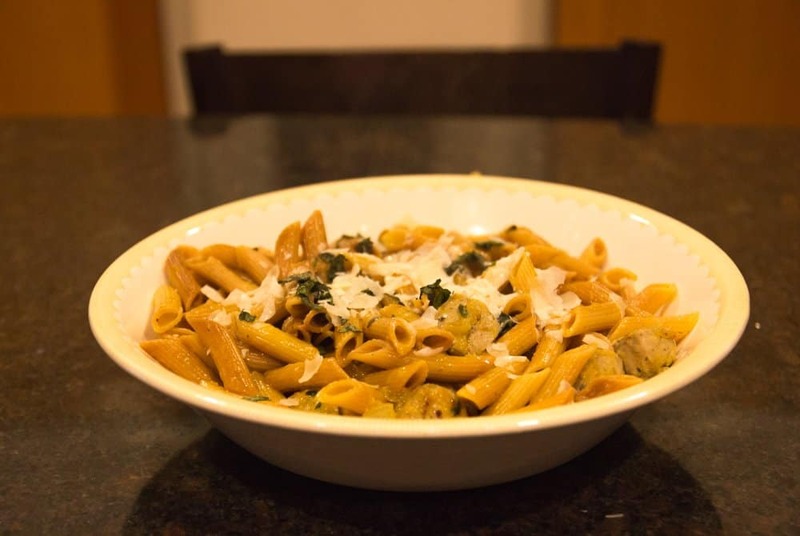 I was looking for a special recipe to try out and I came across this Skillet-Toasted Penne with Chicken Sausage from Cooking Light Magazine. I made a few changes to make a vegetarian version. It was amazingly delicious: creamy without cream, nutty and toasted, and good comfort food for a nice winter night, while light enough for a lovely spring supper. It also took forever. I started cooking it at 5:30 and we sat down for dinner at 7:30. So this isn’t something to whip together in 30 minutes after work. But it would make a lovely healthy Sunday night dinner or a Saturday night for guests when you’re showing off how you can be both a great cook and a healthy one too. 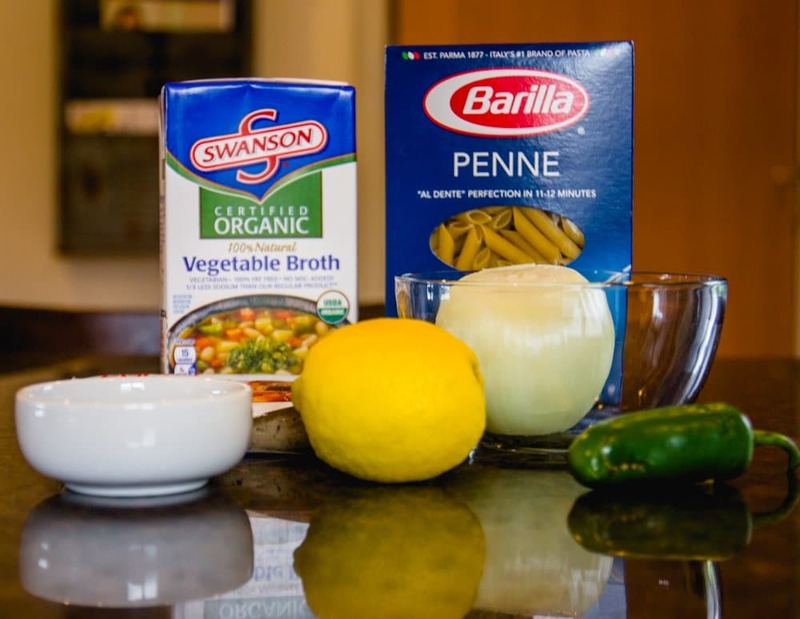 Bring vegetable stock to a simmer in a saucepan (do not boil). Keep warm over low heat. 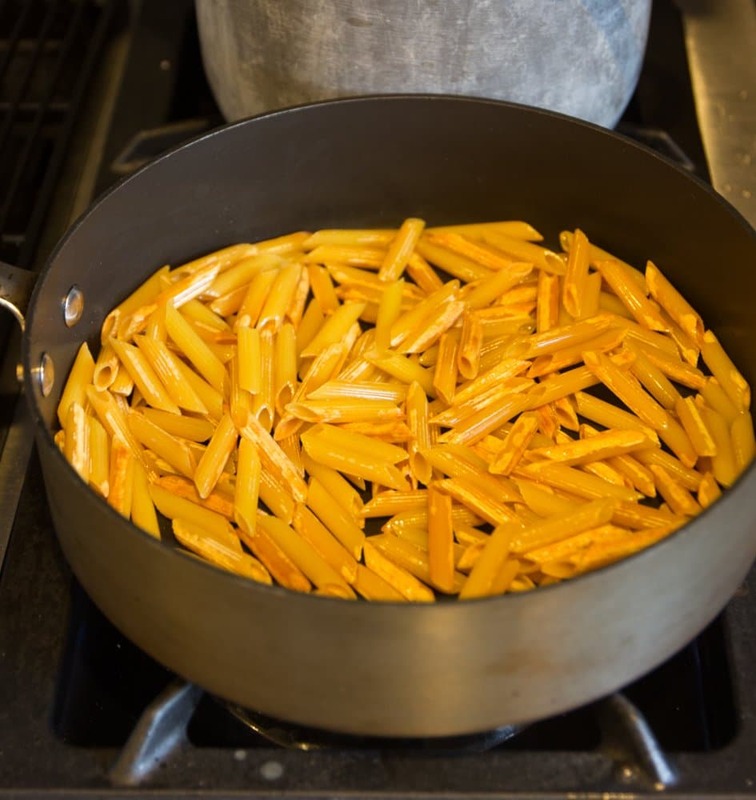 The pasta should start looking toasted but not burned. Add the remaining 1 tablespoon oil, onion, and sausage substitute to pan; cook until browned. Remove sausage mixture from pan. Reduce heat to medium-low. Return pasta to pan. Add stock, 1 cup at a time, stirring constantly until each portion of stock is nearly absorbed before adding the next, stirring frequently. Stir in sausage mixture, lemon juice, jalapeno pepper, and salt. Garnish with cheese and basil. “Good on you” as they say a lot on New Zealand for starting this web site. I like the layout, style and your writing. Alice and I know what you mean about eating the right things. We always thought we were doing pretty good (well, last 20+ years anyways) but have learned a lot since being over here. Some from the direct experience of tasting what “real food” really tastes like again (much easier to find in New Zealand) and some from just the natural process of learning. Oddly enough, while we never ate a lot of meat, we eat more now that we did in the states and that is because of the quality and taste. I am sure you can find it there if you pay enough, we have found the key differences is that most livestock is grass fed all its life, no hormones, prophylactic antibiotics, no GMO grains, no “full on” CAFO style “farms” as in the states, etc. Alice had not eaten beef for 30 years when she came over but now loves a good rare steak every now and then. Don’t have to worry about the eggs or chicken either. Food poisoning is almost not existent and the people here for the most part eat the kinds and varieties of natural (non-packaged or fast food – although there is a fair segment eating that stuff that have similar problems to those in the U.S. who eat it) foods we have semi-forgotten about in the U.S. The fruits, vegies and dairy also taste a lot different in a better way. Well, I could go on but you get the idea. If back over in the states I would do as you are doing, (well, we do here too) – and insist on locally produced, organic where ever possible. Best of luck with your new web site and food experience. If you and your husband ever want to come to NZ you have a place to stay with us. Would love to catch up! Ah, man, I would love to see you guys in NZ (and love to hear how you ended up there)! I’m afraid I would never return – not that that’s a bad thing. Glad to know you guys are doing well.